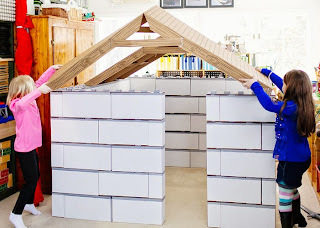 Nearly every kid thinks they’re a professional fort builder. Now, they won’t be too far off, thanks to product designer Brian Lilly. His recent invention, Buildies (giant Legos made out of cardboard) will allow kids to really let their architectural imaginations run wild. Although Lilly used his children to help in the design, he has also found that college students and adults love to use the product nearly as much. This is so cute. Any kids would want to have this one.